There are a number of ways in which you can organize your email messages in Outlook 2010 such as moving related messages to folders, assigning categories to messages and more. In Gmail, you don’t have the option to create folders, but you can use the labels feature to organize related messages. In this Google Apps tutorial, you will learn how to organize your Gmail messages using labels. This is a two-step process. First, you create a label, and then you add a tag. 2. In the left panel of the Gmail account, click the More drop-down arrow, and click Create a New Label. 3. In the New Label dialog box, in the text box, enter a name and click OK.
1. In the top-left corner of the screen, click Settings and select the Labels tab. 2. In the Create a new label text box, enter a name and click Create. 1. In the left panel of the Gmail account, click the label’s drop-down arrow, and click Rename. 2. 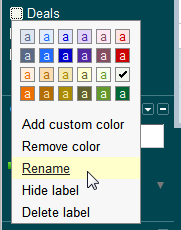 In the Rename Label dialog box, enter a new name and click OK.
1. In the left panel of the Gmail account, click the label’s drop-down arrow, and click Delete label. 2. In the Delete Label dialog box, click OK to confirm the deletion. 1. Display the Inbox view. 2. Check the check box for the message(s) that you want to tag. 3. 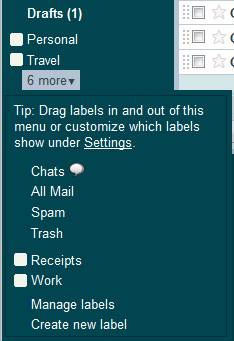 From the labels drop down list, select one or more tags under which you want the message to be tagged and click Apply. 4. The tag is displayed to the right of the message in the Inbox. Now that you have added tags to your messages, you can customize the labels by adding specific colors for the labels. You can select a standard color or apply a custom color. 1. In the left panel of the Gmail account, click the label’s drop-down arrow. 2. 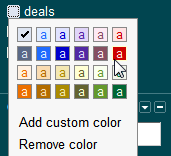 Select a color from the drop-down list. 3. The color is now applied to the message tag. In this Google Apps tutorial, you learned how to organize your Gmail messages. You can also read how to add a Gmail signature and other Office 2010 tutorials in the other sections on our website. If you’d like us to write about an app, drop-us a line using our contact form.